The Kettering Recreation Complex, a hub of sports, fitness and aquatics activity for thousands of citizens in the City of Kettering and surrounding cities, began a major renovation in August 2010. Two of the most visible changes were the construction of an 8,000 sq. ft. fitness addition and a significant refurbishment of the renovated and renamed Adventure Reef Water Park, formerly known as Water Raves. Renovation included updating the existing outdoor pool into an 11,500 sq. ft. leisure pool with zero beach entry, two new waterslides, refurbishing existing waterslides, replacing a sand play area with a water sprayground, redesigning the outdoor tot pool to 870 sq. ft., and in the existing natatorium, replacing the spa and some minor mechanical renovations for the lap pool. 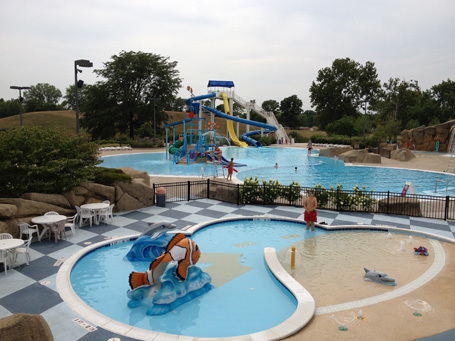 Combining an existing indoor community center swimming pool with the new facilities of an outdoor family aquatic center has provided the City of Kettering with an exciting, popular and financially successful leisure attraction. Families, adults and children are participating in record numbers as aquatic attendance and revenues reach new heights. The fact that revenues from the newly combined indoor and outdoor aquatic facility consistently exceeded operating expenses has become a goal successfully met by the city’s new waterpark. An additional benefit from the on-site separation of the indoor competitive pool and the outdoor waterpark is the ability to conduct separately scheduled events such as swim meets and instructional classes at the same time the waterpark is open for public swimming.